The advanced version of P9 was rumored and referred to as P9 Max, but the rumors got cleared up today when P9Plus was announced. It packs a screen size of 5.5 inches. However, the Max was rumored to come with a 6.2-inch screen, so it can be said that it may release in future. However, the resolutions are same for both the phones announced today. But, the higher end version sports AMOLED. It brings pressure sensitivity, 3D Touch-style. It is known as Press Touch. The company has already launched it with Mate S, but hardly anyone knows about it. With P 9 Plus, it is expected to reach more people. It also runs Android 6.0.1 Marshmallow under Huawei’s Emotion UI (version 4.1). Asian models of both the phones will have dual SIM functionality. Color options will vary by market. 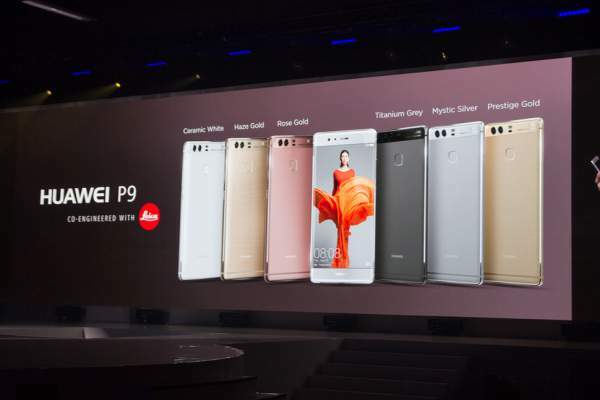 Unlike the lower version, the P9Plus will come only with 4GB RAM and 64 GB internal memory. Its battery capacity is increased to 3400 mAh. Huawei has said it is capable of charging 6 hours of talk time with a just of 10-minute charging with the help of dual-IC Rapid Charge technology. It will also have an IR emitter to control devices. Along with all the above features, it comes with stereo speakers capable of adjusting sound output based on the orientation of the phone. The firm said that the bass will come out from the bottom and treble from above when held portrait. Don’t know how it can be said as stereo speakers. The P9 Plus is priced at €749 and will out in stores from May 20.